So week (page) 4 of the year (book) ends, and so does a project I’ve been working on for (what feels like) ever! Week 4 is a wholehearted week, in all senses. My computer is in for repairs this week, so my usual work is temporarily suspended. Last night I finally finished up this thing I’ve been working on for ages. It’s left a curious sense of spaciousness in my world. I can stretch out my hands and not touch any overrun deadlines, in any direction. I know this grates with some folks, but I relentlessly endeavour to find the silver lining to any situation. It’s a challenge I can’t resist. It appeals to my stubbornly optimistic nature. So I’ve embraced the computer free week. Either my data survives or it doesn’t. My files are in a Schrodinger’s cat state and will be for a few more days. This afternoon I sat in a coffee shop making plans for what I’ve got lined up next to do in a relaxed, calm brain-zone. Such a refreshing change. My engine is idling and I’m planning the next leg of my route. It’s all good. And I’ll be back on the road again soon, come whatever. 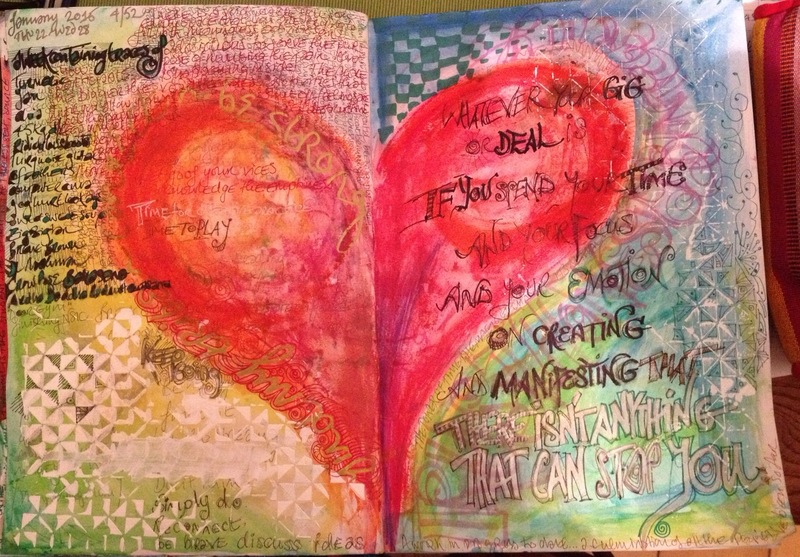 Posted on Thursday, January 29th, 2015 9:48 pm by MixyPosted in mixed media art, week by week 2015Tagged computer, heart, nsic, optimism, schrodingers cat, weekly art journal. Aw thanks so, that made me smile! Sometimes it’s fun to try arting in new places 😃 have fun! love this one, perfectly done.